Top Outsourcing Destinations in 2016 | Quality House Ltd.
Everybody is Curious about the Top Outsourcing Destinations in 2016. Being aware of the top cities over the world that are known as outsourcing centers, we shall also bear in mind that there is a difference between the preferred countries to outsource and the top cities of outsourcing. The five most preferred countries for outsourcing may surprise you, but they do have definite advantages that will make them even more important global outsourcing players in the next few years. numbers[Argentina – it has low market and labour costs and with budgets tighter than ever, a perfect destination for UK companies. The country possesses a large pool of work force that is highly literate in terms of IT and language skills – Spanish is the first language in the country and English is the second. Argentina is also quite rich in programmers and developed its IT talent during the dot – com boom in the 90’s. The unquestionable pros of the country are the natural resources, the highly skilled IT population and the diverse industrial base. The cons are connected with the very little efforts of the government to support and develop the outsourcing. Having in mind the many economic problems, one should consider carefully the stability of the country. Bulgaria – it is definitely gaining popularity as an outsourcing center since 2007. Bulgaria is even catching up on more established ones as the Czech republic, due to the lower labour costs and the population that is quite knowledgeable in languages. The country also competes with Slovakia, Hungary, Poland, Russia and Ukraine. It has a relatively good educational system that focuses on technical subjects. The pros are connected to its membership in the EU and the same rules that apply to all members. Politically, the country has been quite stable since 1997, but the con we can notice is that the costs are higher than the ones in Africa, India and the Middle East and at the same time definitely lower than Russia, Poland, etc. Even though, in 2015 according to Cushman & Wakefield, Bulgaria took the third position as an outsourcing center and in 2016 took the seventh position due to the increase in the costs. Even though, the country is quite more competitive in terms of cost compared to Poland and even Romania. Besides Sofia, emerging IT centers in the country turn out to be Plovdiv, Varna and further in the future Ruse, Veliko Tarnovo, Blagoevgrad and Bourgas. Also, a great advantage of the country is the flat corporate tax and the desire of the educational system to be in partnership with the business. China – undoubtedly the best one in supplying low – cost outsourcing resources – particularly work force. It is a great advantage if the outsourcing company is also dealing with customers or companies who have headquarters in China or Mandarin speaking countries. Unfortunately, that is not the case with the English language skills. The country also lacks good protection of intellectual property, so software products could be easily duplicated with a little comeback. The time difference is also a setback, especially for US companies. And never forget the cultural barrier. Chinese have a different view on the world and their traditions differ quite a big deal from the European or American ones. Egypt – the Middle East and Africa are growing as a home to remote services for global companies in Europe, Asia and the US. Egypt, Jordan and the United Arab Emirates are all on the rise, along with Tunisia, Ghana, South Africa and Israel – with its extremely skilled programming work force. Egypt has one of the largest talent pools in the Middle East. The language skills are also satisfactory and the government offers tax incentive to outsourcing projects. Egypt is also recognized for its young working population. The cons are mainly connected with the political stability – it is quite volatile. In the beginning of 2016 an issue of The Annual Report by A. T. Kearney was published. 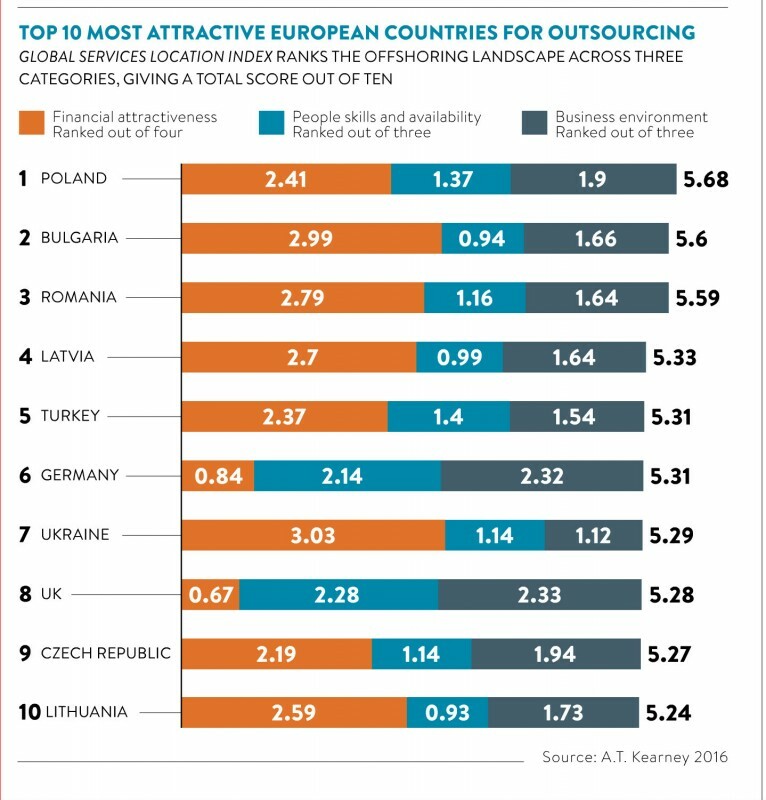 As one of the leading reports its aim is to assess the top outsourcing destination based on three main indexes: financial attractiveness, people skills and availability and business environment. The indexes are measured by 38 metrics and show the countries that are best for outsourcing the BPO, the IT and the voice services. So, what is the picture in 2016? As you can see from the chart above from the top 19 countries to outsource, 5 are European countries and all of them are in Eastern Europe. Having in mind that the outsourcing destinations are in Eastern Europe, we should pay attention to the main reasons why they are a preferred partner. 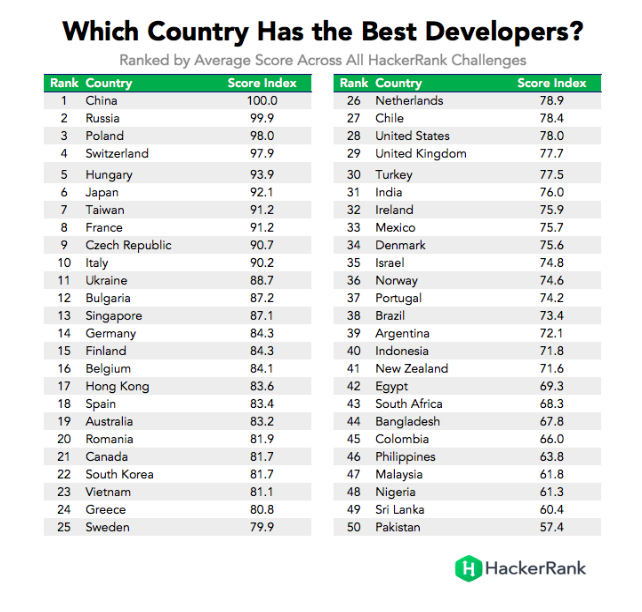 Bulgaria takes the second place and that is not a surprise at all as a survey by HackerRank in 2016 has outlined the countries where the best developers live. 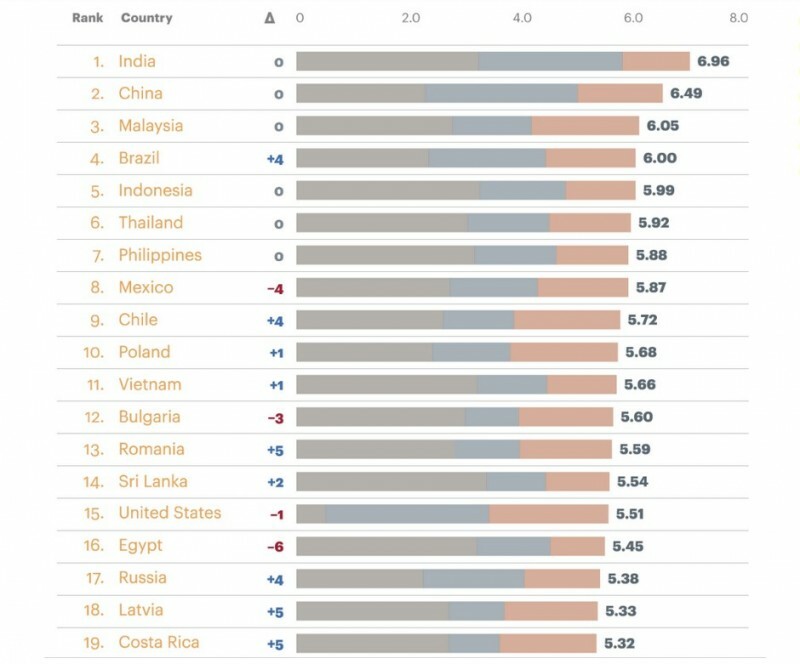 Bulgaria, even small in area and population, takes the 12th place. Following the survey of HackerRank, the Bulgarian programmers, based on the challenges set are best in: Java and Python. Look forward to our next article getting into details about Eastern Europe and why it might be much better than Asia.